LibreCad is a wonderful free CAD program that I quickly mastered. 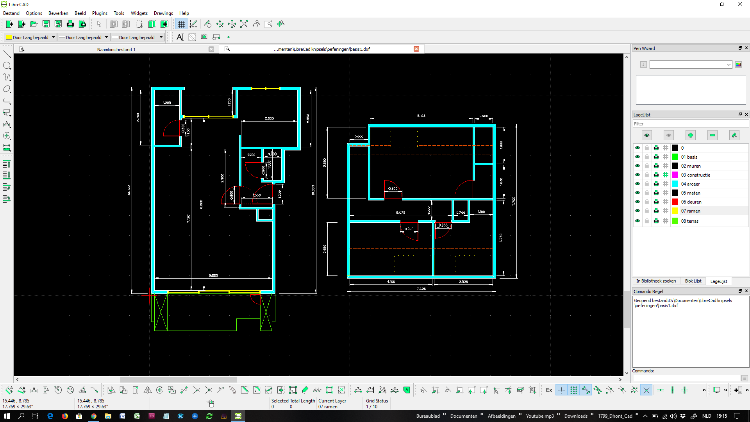 I had some experience with Autocad, but it took some time to penetrate the secrets of LibreCad. 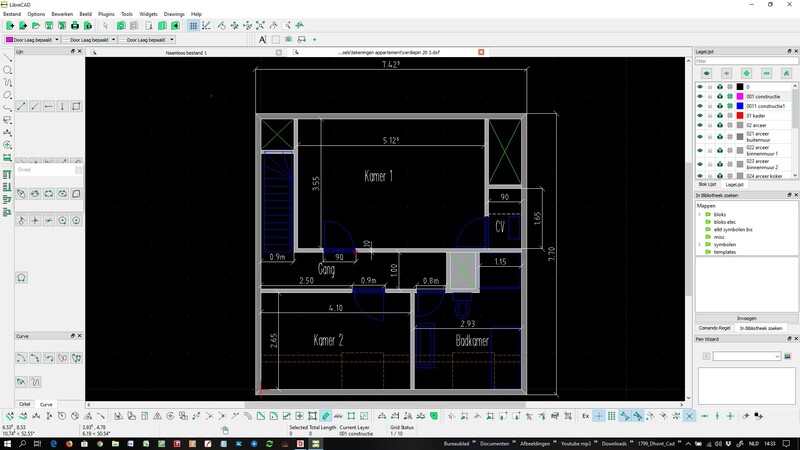 I have planned my apartment and I want to share the files to show that the use of LibreCad is not that difficult. Well done! But it's not finished yet. We are awaiting your drawings featuring all the bells and whistles, like dimensions, elevations with shadows and so on what is needed to make nice looking plans. Why don't you upload your files here on the forum? 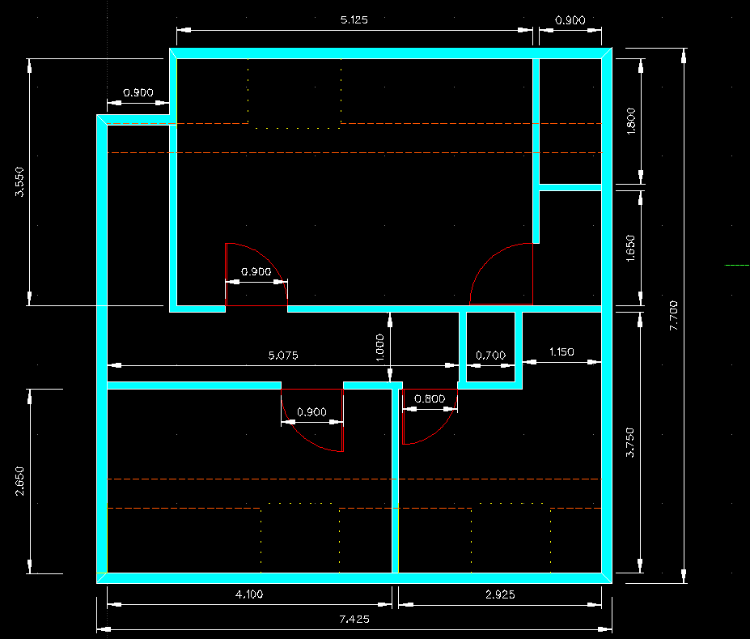 Or insert an image of the plan, from a screenshot or a pdf from Print Preview. It's a good thing to have more samples of work done with LibreCAD here. I have added dimension, but are there different settings for that? two of my dimensions and one of my institutions. Can someone tell me what the correct settings are for the dimension? What do you mean with "elevations with shadows and so on what is needed to make nice looking plans"
There is nothing wrong with your dimensions, if you like them this way. 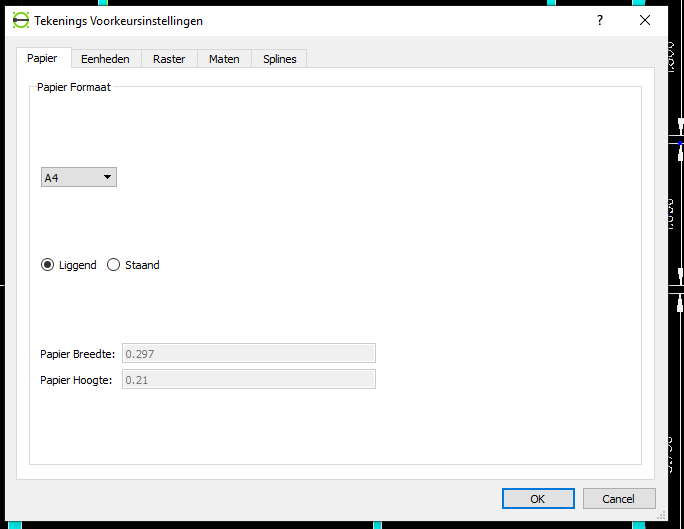 Just extension lines "Offset" and "Enlarge" are way too small, not visible. You could use the"General Scale" setting according to your intended scale, probably 1:50. So type in "50". Then the sizes of all elements of the dimension will be enlarged automatically 50 times (hidden), as they will be scaled down again in the printing process. 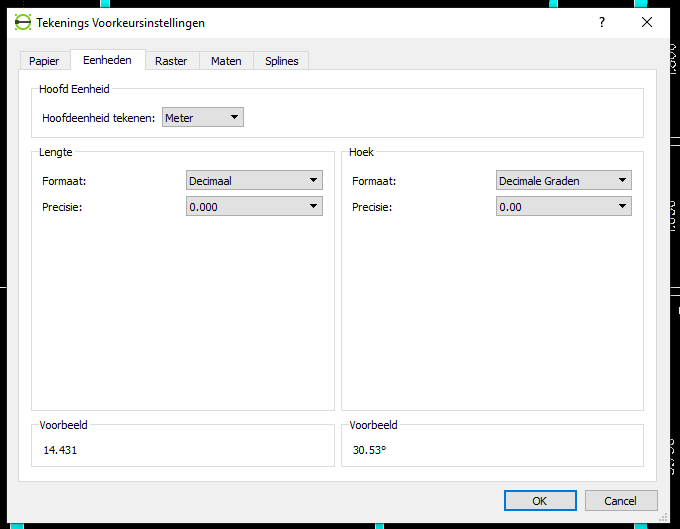 This way you don't have to recalculate and change these values if you decide to rearrange and print the the drawing in a different scale, just change the "General Scale". The individual sizes like "Text Height" then have to be typed in in the real size on paper. So in your case a 3 mm size letter would be 0.003 m.
You also could use Extension lines "Fixed length", as is the use for architecture (at least in Germany). 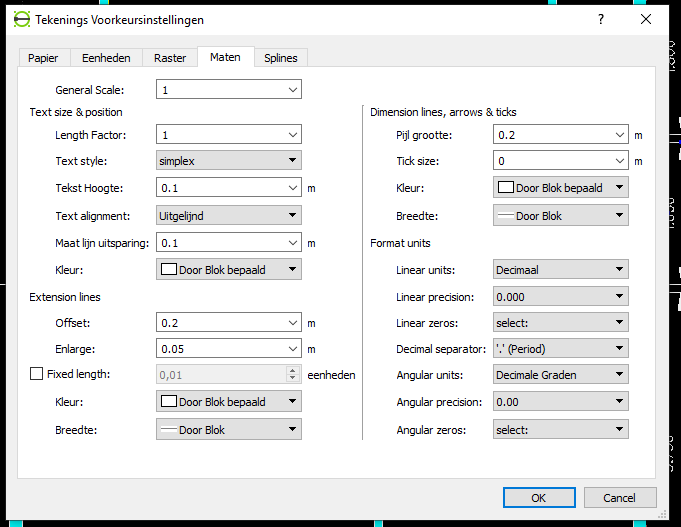 In LibreCAD 2.1.3 "Fixed length" did not submit to "General Scale", in 2.2 RC it does. But unfortunately the input box was not changed and allows only two digits after the decimal point. So in your case the smallest possible value 0.01 m results with "General Scale" in 10 mm on paper, which is too long in most cases. So you can either not use "General Scale" or not use "Fixed length" or accept the 10 mm length. If you do not want that lifted small 5 as half centimeter (German standard, in Belgium too? ), you must not use Format units - Linear units: "Architectural (metric)", just Decimal instead. 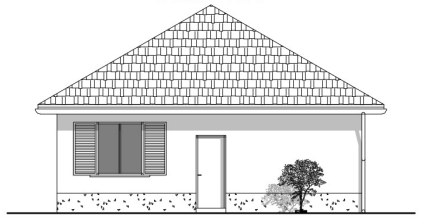 The shadows in an elevation (side view) you have to draw manually with a solid grey hatch. 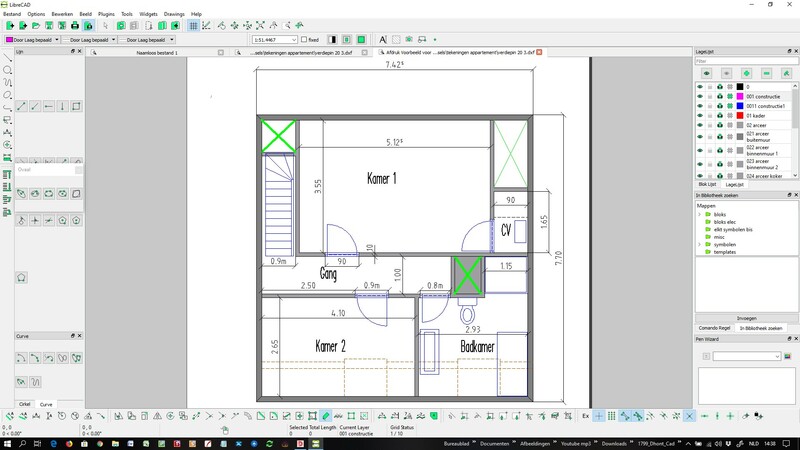 This is an example from Claudio Guarnieri's tutorial http://forum.librecad.org/file/n5708464/tutorial_-_let's_draw_a_little_house_project.zip It is a bit outdated, as the user interface and the possibilities have changed / improved, but still worth to have a look at. If you have a coloured facade drawing, it's more difficult. As we don't have transparent fillings to use as an overlay for shadow, we might use a normal hatch. Thin lines or maybe points. С кем и где можно пообщаться на эту тему на русском языке.